Iron Age Britons were importing olives from the Mediterranean a century before the Romans arrived with their exotic tastes in food, say archaeologists who have discovered a single olive stone from an excavation of an Iron Age well at at Silchester in Hampshire. The stone came from a layer securely dated to the first century BC, making it the earliest ever found in Britain – but since nobody ever went to the trouble of importing one olive, there must be more, rotted beyond recognition or still buried. The stone, combined with earlier finds of seasoning herbs such as coriander, dill and celery, all previously believed to have arrived with the Romans, suggests a diet at Silchester that would be familiar in any high street pizza restaurant. The excavators, led by Professor Mike Fulford of Reading University, also found another more poignant luxury import: the skeleton of a tiny dog, no bigger than a modern toy poodle, carefully buried, curled up as if in sleep. However it may not have met a peaceful end. “It was fully grown, two or three years old, and thankfully showed no signs of butchery, so it wasn’t a luxury food or killed for its fur,” Fulford said. 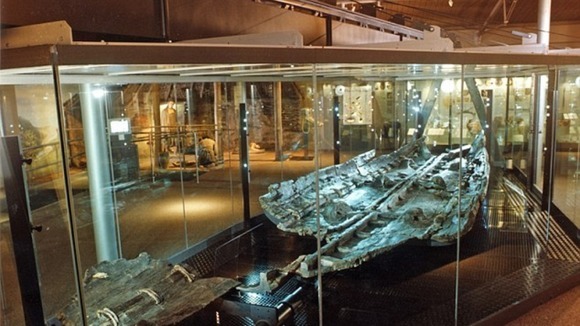 “But it was found in the foundations of a very big house we are still uncovering – 50 metres long at least – so we believe it may turn out to be the biggest Iron Age building in Britain, which must have belonged to a chief or a sub chief, a very big cheese in the town. And whether this little dog conveniently died just at the right time to be popped into the foundations, or whether it was killed as a high status offering, we cannot tell. Fulford has been leading the annual summer excavations at Silchester, which bring together hundreds of student, volunteer and professional archaeologists, for half a lifetime, and the site continues to throw up surprises. It was an important Roman town, but deliberately abandoned in the 7th century, its wells blocked up and its buildings tumbled, and never reoccupied. Apart from a few Victorian farm buildings, it is still open farmland, surrounded by the jagged remains of massive Roman walls. Fulford now believes that the town was at its height a century before the Roman invasion in 43AD, with regularly planned, paved streets, drainage, shops, houses and workshops, trading across the continent for luxury imports of food, household goods and jewellery, enjoying a lifestyle in Britain that, previously, was believed to have arrived with the Romans. This sodden summer have driven the archaeologists to despair, with the site a swamp of deep mud and water bubbling up in every hole and trench. “Conditions are the worst I can ever remember. Ironically, the wells are the easiest to work in because we have the pumps running there,” Fulford said. The tiny dog is one of dozens that the team has excavated here over the years, including one that was buried standing up as if on guard for 2,000 years. A unique knife with a startlingly realistic carving of two dogs mating was another of the spectacular finds from one of the most enigmatic sites in the country. Visitors can observe the archaeologists’ trench warfare this weekend, when the site opens to the public as part of the national festival of archaeology, one of thousands of events across the country. 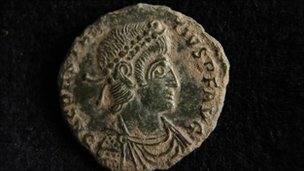 More than 30,000 Roman coins were found by archaeologists working in Bath in 2007, it has been revealed. 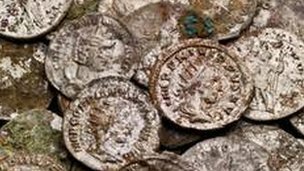 The silver coins are believed to date from 270AD and have been described as the fifth largest UK hoard ever found. The coins are fused together and were sent to the British Museum. Conservators are expected to take at least a year to work through them. A campaign has now been started at the Roman Baths to try to raise £150,000 to acquire and display them. The size of the find is not as large as the Frome Hoard in April 2010 when more than 53,500 coins were discovered by metal detectorist Dave Crisp near Frome in Somerset. The coins found in this hoard date from a similar time and are thought to be the largest ever discovered in a Roman town in the UK. Roman Baths spokesman Stephen Clews said: “We’ve put in a request for a formal valuation and then hope to buy the coins to display them at the baths. “At the time there was a lot of unrest in the Roman Empire so there may be some explanation for why the coins were hidden away. “The find is also unusual as it was discovered by professional archaeologists as opposed to an amateur using a metal detector,” he added. Jonathan Glancey’s introduction to the Guardian’s Guide to British Architecture encourages a reading of architecture and an immersion in its language (Architecture: an autobiography, 10 September). The buildings “tell tales of people who have lived, loved and worked inside them”. The stories of buildings’ birth, life and death, their design and fabrication, use and abuse, rebirths and ruin, are indeed the narrative that describes a society and its architecture. Yet the guide as a whole surely misses the deep and longer story of British architecture. Joseph Rykwert’s seminal work The Idea of the Town views the myths and rituals of many previous civilisations; Glancey only allows a brief view of “eight millennia” of architecture with a mention of “the cities and ziggurats (towers) of ancient Sumeria, now hidden from the world in the deserts of southern Iraq”. Surely Britain is allowed its ancients: does the history of architecture only start with the arrival of Christianity, the dominant force in architecture? Surely it should include places deep in our psyche and defining the last six millennia. Where are the precise fabrications of Stonehenge, and the domestic and environmental connectivity exhibited at Skara Brae? Where are the Romans’ technical marvels, Hadrian’s Wall, and their integrated plumbing and heating? Are we witnessing an editing moment similar to the TV series Civilisation; or perhaps these Unesco world heritage sites are seen as just buildings, like Nikolaus Pevsner’s bicycle shed – and therefore written out of the story? 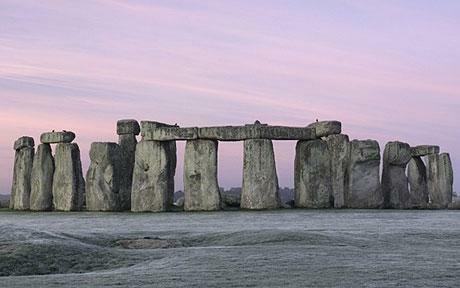 They were important enough for John Wood, the designer of the Circus in Bath, to survey Stonehenge; and earlier Christopher Wren, a great baroque master, allegedly visited and marked the stones. 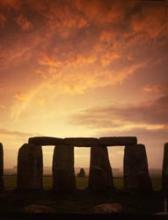 Peter Ackroyd, in his Hawksmoor novel, develops a narrative that connects Wren at Stonehenge to the death of Wren’s son at the Pyramids of Giza. Glancey compares the reading of literary greats to the reading of buildings, yet he misses the sensory duet between body and buildings, exemplified by Georges Perec, who combined mathematical and literary puzzles across the life of a Parisian apartment block in Life: a Users Manual. My own favourite from Dickens is a body landscape duet from Great Expectations as Magwitch turns Pip in Cooling churchyard, creating a large-scale metaphoric Thames rotation, moving London west to east. For me as an architect and tutor, the longer view of British architecture, with civilisations waxing and waning in the face of creative and destructive environmental change, wields salutary lessons. We can take fictional futures that use the deep and modern past such as those of China Miéville, JG Ballard and Italo Calvino. Digging beyond Calvino’s Invisible Cities, one arrives at the architecture of Cosmicomics, and a fascination in new and rare materials, scientific concepts that become mythical in the Italian’s hand – they are hinted at in your guide’s article on new materials. A chance discovery of coins has led to the bigger find of a Roman town, further west than it was previously thought Romans had settled in England. 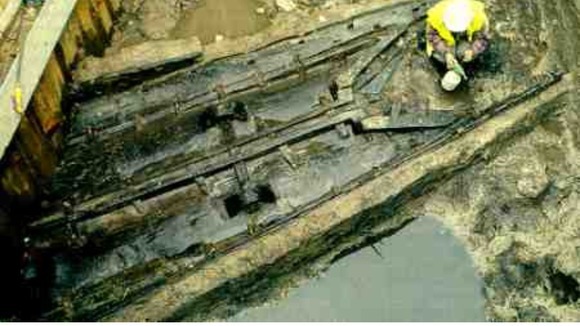 The town was found under fields a number of miles west of Exeter, Devon. 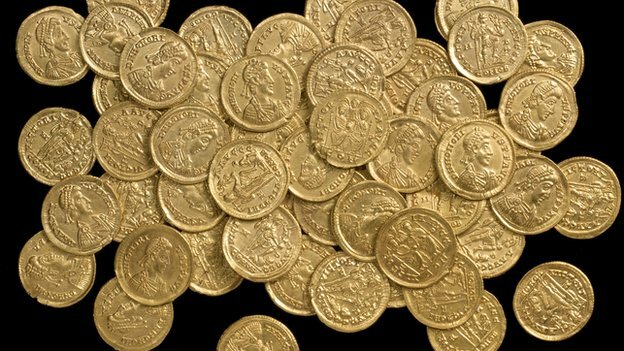 Nearly 100 Roman coins were initially uncovered there by two amateur archaeological enthusiasts. It had been thought that fierce resistance from local tribes to Roman culture stopped the Romans from moving so far into the county. Sam Moorhead, national finds adviser for Iron Age and Roman coins for the PAS at the British Museum, said it was one of the most significant Roman discoveries in the country for many decades. “It is the beginning of a process that promises to transform our understanding of the Roman invasion and occupation of Devon,” he explained. After the coins were unearthed by the local men out using metal detectors, Danielle Wootton, the University of Exeter’s liaison officer for the Portable Antiquities Scheme (PAS), which looks after antiquities found by the public, was tasked with investigating further. After carrying out a geophysical survey last summer, she said she was astonished to find evidence of a huge landscape, including at least 13 round-houses, quarry pits and track-ways covering at least 13 fields, the first of its kind for the county. “You just don’t find Roman stuff on this scale in Devon,” said Ms Wootton. She carried out a trial excavation on the site, and has already uncovered evidence of extensive trade with Europe, a road possibly linking to the major settlement at Exeter, and some intriguing structures, as well as many more coins. “This was a really exciting discovery,” said Ms Wootton. But she said most exciting of all was that her team had stumbled across two burial plots that seem to be located alongside the settlement’s main road. 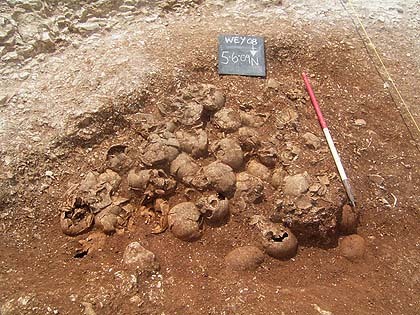 “It is early days, but this could be the first signs of a Roman cemetery and the first glimpse of the people that lived in this community,” she explained. Not enough excavation has been done yet to date the main occupation phase of the site, but the coins that were found range from slightly before the start of the Roman invasion up until the last in 378AD. The Romans reached Exeter during the invasion of Britain in AD 50-55, and a legion commanded by Vespasian built a fortress on a spur overlooking the River Exe. This legion stayed for the next 20 years before moving to Wales. A few years after the army left, Exeter was converted into a bustling Romano-British civilian settlement known as Isca Dumnoniorum with all the usual Roman public buildings, baths and forum. It was also the principal town for the Dumnonii tribe, a native British tribe who inhabited Devon and Cornwall. It was thought that their resistance to Roman rule and influence, and any form of ‘Romanisation’ stopped the Roman’s settling far into the south west. For a very long time, it was thought that Exeter was the limit of Roman settlement in Britain in the south west, with the rest being inhabited by local unfriendly tribes. Some evidence of Roman military occupation has been found in Cornwall and Dartmoor, thought to be protecting supply routes for resources such as tin. However on this site, more than just the coins are Roman. Pottery and amphora fragments recovered suggest the town embraced trading opportunities in Europe that came with Roman rule, and a fragment of a Roman roof tile has also been found. Danielle Wootton received some funding from the British Museum, the Roman Research Trust and Devon County Council in June to carry out the trial excavation but said more money was needed as they still had not reached its outer limits. “We are just at the beginning really, there’s so much to do and so much that we still don’t know about this site. “I’m hoping that we can turn this into a community excavation for everyone to be involved in, including the metal detectorists,” she explained. 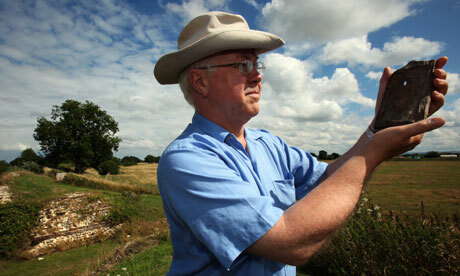 Sam Moorhead said he believed more Roman settlements may be found in the area in the next few years. The excavation of this unique site will feature in the forthcoming BBC Two series Digging For Britain.